With Breeze you may work with multiple streams of video, audio and pictures simultaneously, within a unified user friendly environment. You may play video and audio from files at the local computer or network, from the CD/DVD disk or from the VCR (videocassette recorder). You may stream video and audio from the Internet, watch TV, listen to FM radio, capture live video and audio from Webcams, DV camcoders and microphones, transfer images from scanners and digital video cameras, view and edit pictures. User interface of Breeze allows operating with video and audio streams, with individual images and media devices similarly, in a simple intuitive and uniform fashion. You can watch, capture and manage several video, audio and picture streams coming from the various sources simultaneously, from the local files and media devices and from the Internet. You can play, step back and forth through videos and pictures, compare them side by side, capture and save images of your choice "on the fly". Think if you can thumb and scroll back and forth several "video books of pictures" at once. Multiple Tabbed Document Interface based on the "Fluid GUI" architecture, multiple media channels and video ports in each media document, flexible configuration features, video playback cache, image and video capture, "Picture In Picture", "Video Care" create a feature rich media environment. For business users Breeze is an effective tool for documenting and side-by-side comparative analysis of video and images in the areas such as professional sport, videography, security, scientific, medical, engineering, video and photo editing applications. 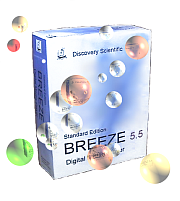 Breeze supports 100+ video and image formats including AVI, MPEG-1, MPEG-2, MPEG-4, VOB, WMV, ASF, FLV, SWF, MOV, DV, H.264, DivX, XviD, OOV, MP3, WMA, WAV, JPEG, JPEG-2000, PNG, GIF, TIFF, BMP, 50+ YUV / YCbCr formats. It supports several types of media (video / audio) devices. Multiple Tabbed Document Interface, "Fluid GUI"
"Video Care" functionality: watch your video and keep an "eye" on things around.